If lab space is a concern for you, the compact, high-vacuum Desktop Pro sputtering system offers superior productivity yet occupies less than 36 inches (914 mm) of desk space. 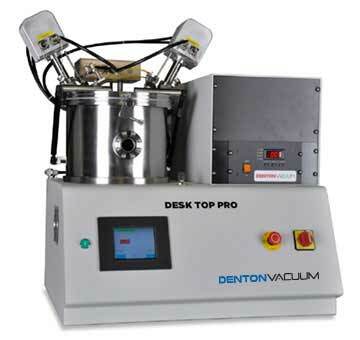 Truly versatile, the Desktop Pro can provide for co-sputtering and the deposition of magnetic and/or dielectric materials. The Desktop Pro supports one or two cathodes in a confocal configuration, delivering high film uniformity over a 4-inch diameter. Able to pump down to high vacuum (10-6 torr range) in less than 30 minutes, it’s the perfect solution when fast change-overs are needed within multi-user environments. This DC & RF sputtering system will increase your research productivity and deliver consistent, repeatable performance, while saving space in your test environment.